The African headtie has a long and meaningful history in West African culture, as well as being a glamorous fashion accessory nowadays. In Ghana, it is traditionally considered to be a garment worn on a religious day, which could be any day from Friday to Sunday depending on what major faith you follow. 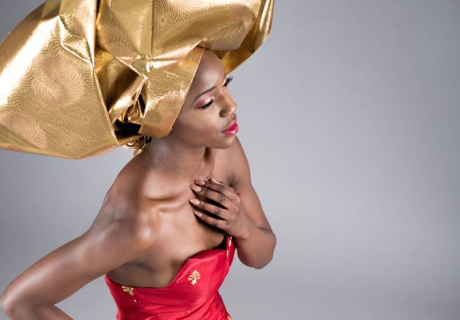 Elsewhere in Nigeria, the headtie is more commonly referred to as a ‘gele’ and is often larger than other designs. You’ll tend to find that the grander the occasion, the more elaborate the gele becomes, although that doesn’t mean it cannot be used when embarking on daily activities too. Wherever it’s worn, the headtie often covers a woman’s hair as well as her ears, with only the face and earrings left exposed. It is the main component of a look, the highlight of the clothes and can grab attention regardless of whatever else the person is wearing. As a result, it has now been adopted across the world from South America to Europe, with people of all cultures adapting their style to it. If you want to see how an African headtie can tie into your fashion, here’s how to put one on. Firstly, take the material and hold it lengthways at the back of your head, stretching it out so that both sides are perfectly equal. After this, pull one side of the headtie around and across the front of your head, making sure to keep the other side from falling. At this point, using the other side of the material that you’ve been holding onto, pull it across the top of your head so that much of your hair is covered with two long, folded cloths at either side. Then take the left side and wrap it again, around the back of the head and over to the right side. Like before, you do the same with the opposite side, wrapping in around the back and to the left. Finally, all you need to do is fold both pieces of the head tie in front of your head, using bobby pins or whatever else you have at your disposal to secure them in place.